Press release below from SoCal Ed. Some very interesting news about a cooperative project to further investigate the seismic environment at the San Onofre Nuclear Generating Station. ROSEMEAD, Calif., April 27, 2012 — Southern California Edison (SCE) and Scripps Institution of Oceanography at the University of California at San Diego will collaborate on a project to gather seismic data off the coast of the San Onofre Nuclear Generating Station (SONGS). The work, part of SCE’s seismic research projects for SONGS Units 2 and 3, will involve state-of-the art data-gathering and analysis technologies, and will begin later this year and continue through 2013. Scripps scientists will lead the project, which will include collecting and processing data from 2-D and 3-D multichannel seismic reflection and refraction off San Onofre State Beach. The raw and processed survey data will be open-source and available to other experts to view and use in further studies. This data will also be made available to the general public. Offshore seismic research is conducted with specially equipped boats that tow cables, or streamers, with underwater microphones at regular intervals. Two-dimensional seismic surveys usually have one streamer; three-dimensional surveys have four or more. Besides evaluating the existing and potential faults in the area, the seismic reflection and refraction surveys will image the offshore structures at an unprecedented resolution, and will allow scientists to test between the alternative hypotheses for the tectonic deformation observed off San Onofre. In addition, the geophysical surveys will reveal vertical motions of the crust through time, associated with margin reorganization. Both units of the plant are currently safely shut down for inspections, analysis and tests. Unit 2 was taken out of service Jan. 9 for a planned outage. Unit 3 was safely taken off line Jan. 31 after station operators detected a leak in one of the unit’s steam generator tubes. Readers of Atomic Power Review have certainly noticed some focus on the continuing situation at SoCal Ed's San Onofre nuclear station in the last few weeks, due to the problems experienced with the replacement steam generators installed in that plant. APR has made a number of posts on this topic, as reports and as official information have warranted. Because of the rather intense media coverage and also because of the deliberate focusing of energy on this matter by established anti-nuclear forces, I wrote a considerably detailed piece on steam generator design for APR which can be seen by clicking here; this piece appeared first on March 20, 2012 and has had considerable traffic. Now that further details about the real problems being encountered at San Onofre 2 and 3 have been released, and since the anti-nuclear forces at large have not let off their campaign of fear, a number of us have decided that it was time to present something substantial in order to let our regular readers here know what is really going on "inside" in terms of the steam generator design, and concerning the replacement. For this, I've been very fortunate to be able to ask Meredith Angwin to construct a piece covering just those details. Meredith not only is well known as the author of Yes Vermont Yankee; she was also closely involved with steam generator design and secondary chemistry work during her years working with the Electric Power Research Institute. Meredith wrote the paper you are about to read and submitted it to a number of industry experts and analysts for peer review, which has taken some time. Today, the piece is prepared for publication - and with this publication I will also note that Meredith is the first ever guest author of a piece on Atomic Power Review. Her presentation and her followup comments are now presented; I will have some closing remarks at the end of this post. Much of Gundersen’s report appears to be based on an article in Nuclear Engineering International magazine about the development of the SONGS generators. The report was written about the generator design process, before any issues were found at the generators themselves. The NEI magazine article’s insight into the design process allows Gundersen to put an interesting negative spin on things. In his first report, Gundersen’s main assertion is that the SONGS steam generators were replaced with new generators that were not exactly like the old generators, and this was the cause of the problem. He claimed that they changed the alloy, changed the design, and the new configurations were not tested. Also somehow all this sneaked by the NRC without review, because the new steam generators were supposed to be just like the replaced steam generators. Instead of dissecting Gundersen's reports word for word, I want to show that no steam generator will ever be replaced by a steam generator exactly like the old one. Extensive research has been done to improve steam generator design and performance. I will discuss research as it was led by the Steam Generator Owner's Group at EPRI in the mid-80s to the 90s. I was a project manager and then a consultant to that group from 1982 to the late 1990s. My speciality was water chemistry, corrosion control, and testing of alloys against corrosion. I have not followed the continued Steam Generator changes since around 1998-2000, when my career took a different path. However, I have had this article reviewed for accuracy by several people. (Any mistakes are all my own.) This article will show how research has continuously improved steam generators. A new steam generator will never be just like the older version. The tubesheet is a thick piece of metal that sits at the bottom of the steam generator and separates the primary side (water that flows through the reactor) from the secondary side (water that flows through the turbines). Holes are drilled into the tube sheet, and the steam generator tubes are inserted into those holes. Primary water flows inside of the tubes, and secondary water flows outside of the tubes. The tubes are the source of the heat transfer. 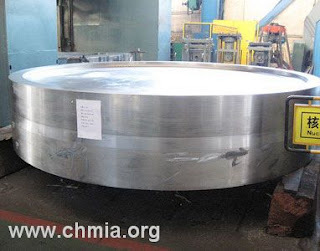 Above: Tube sheet forging for nuclear steam generator; illustration courtesy China Heavy Machinery Industry Association. 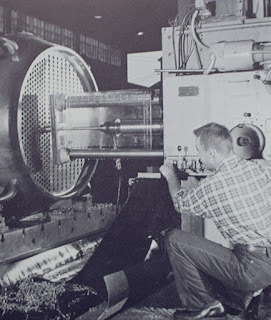 Above: Horizontal boring machine performing drilling operation on nuclear plant heat exchanger tube sheet at Babcock & Wilcox plant, Barberton, Ohio. Photo from APR collection / Will Davis. 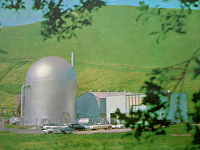 According to the article in NEI, San Onofre’s planning for the tube sheet replacement included building a full-scale mock-up. I have don’t know about the testing they did, but I will talk a little about tube sheets and what we did at EPRI. First, you have to drill a hole in the tubesheet. Once the holes are (carefully) drilled, the tubes must be inserted. The hole is bigger than the tube (of course) but the tube must make a good seal with the hole in order for the tube sheet to remain a pressure barrier. Something (an expander, a small explosive charge, various methods) is placed within the tube, and it is pushed out forcefully until it is really sealed into the tubesheet. This sealing process is only for the lower part of the tube within the thick tubesheet. Near the top, the tube is not sealed within the tube sheet, but an open crevice exists. The crevice is there because otherwise the tube would go from tightly-sealed in place within the tubesheet to moving around in the water flow. This sudden transition could break the tube. The crevice sort of supports the tube and eases the transition. However, the crevice is a corrosion trap. More on that later. 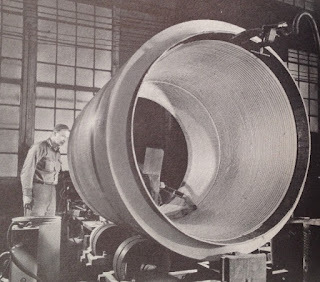 Immense amounts of work was done, for years, on proper alloys and heat treatments for the tubing. After extensive testing, Alloy 690 with a certain heat-treatment (nicknamed sensitisation, of all things) was found to be most resistant to stress corrosion cracking, which is usually the worst problem the tubing encounters. The tube usually encounters this problem (surprise) at the tubesheet crevice. The work on alloy 690 included much testing in scale models of all types, and also careful assessment of existing tubes (alloy 600) and their problems, figuring out what heats and heat treatments seemed best able to cope with corrosion. Tube support plates are a mixed blessing. 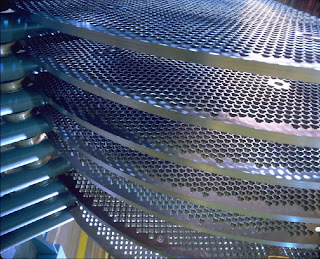 They are large disks (with holes for the tubes) that are at various points in the steam generator. They are necessary to prevent the tubes from moving around too freely in the flow of secondary water. However, they are also something that can fret the tubes that bang into them, and the support plates themselves corrode. Support plate corrosion products are more voluminous than the support plates were, and they fill the space between the support plates and the tube. Then the corrosion products continue to grow, eventually pushing against the tubes, denting them and causing them to fail routine inspections and be taken out of service (plugged). Above: Steam generator support plates. Photo courtesy AREVA via Meredith Angwin. As I said, support plates are a mixed blessing. So it's always a tradeoff (engineering is like that) about how many support plates you put in...vibration versus tube denting. Take your compromise here! The first generation of support plates can most simply be described as awful. The holes for the tubes were drilled or punched with no particular quality control on the size. The material was a carbon steel that corroded like crazy, denting tubes right and left. When I saw the new support plates being made by Areva in France with the careful measurements, polishing, 304 stainless steel...I was so impressed! Nobody would buy a steam generator like the "old days" anymore! Okay, let's get back to those crevices. We will talk about the crevice in the tubesheet, and the somewhat similar crevices between the tubes and the support plates, higher in the steam generator. This means we also have to talk about water chemistry. When I joined the Steam Generator Owner's Group, I came from the geothermal energy group, and figured that with the usual water control of the water that went through the turbine (secondary water), the steam generators would have no problems of the kind we had in geothermal. In geothermal, we had to use whatever water nature chose to supply and many times it was brine. We sometimes used a shorthand of 2X, 3X etc for twice as concentrated as seawater, three times as concentrated etc. Hello steam generators. Same shorthand for the water in the crevices! The temperature differential in the crevices concentrates salts, and the concentrated salts are very corrosive. The problem is simple. The crevices have poor heat transfer so they are basically at the temperature of the primary side. The rest of the steam generator is at the lower temperature of the secondary side. However, the whole steam generator has to be at the same pressure. The crevices are hotter than the bulk water. Their higher temperature should mean that the crevices would have a higher pressure than the bulk water. But they can’t have a higher pressure than the bulk water. So what happens? The presence of ions in the water lowers the pressure of the water, at any given temperature. The hotter crevices end up collecting ions, which lowers the partial pressure of the water in them to the same pressure as the water in the rest of the generator. If you take a sample of bulk water in feedwater or blowdown, it might be 50 ppb ions. Meanwhile, back in the crevice--2X! The crevice has ions at twice the concentration of seawater. So the crevice has same pressure as the bulk water, though it is at a higher temperature. This also led to the early belief that "steam generators clean themselves up." The idea is that the bulk water might be 20 ppm salts when you start up the SG , but by the time you are at temperature, bulk water would be at 1 ppm. A miracle! Conservation of mass finally defeated! Of course, the ions were "hiding out" in the crevices, and would "return" when the temperature dropped. People eventually caught on, but crevice corrosion of all sorts were very common in the early days of supposedly "self-cleaning" steam generators. By the time I joined the Steam Generator group at EPRI, people knew about hideout and hideout return. The push to clean up the incoming water was in full swing. Water impurities were cleaned, and incoming water was more likely to be at 50 ppb than 50 ppm. I was involved with that, and I even recruited ultrapure water specialists from the Silicon Valley semiconductor industry as consultants to the utilities. Alas, it was only partially helpful. Cleaning the water helps slow down the concentration process in the crevice, but it doesn't stop it. The physical requirement for equal pressure throughout the steam generator trumps any pathetic attempt to slow down the process of concentration. We had to try to understand the crevice chemistry, and add ions to the steam generator that would neutralize the crevice and stop most of the corrosion. At a simple level, we knew that the source of the small levels of contamination in the water was miniscule inleakage from the condenser. If the plant was on freshwater, the inleakage from the condensers concentrated basic, leading to alkaline types of corrosion. Seawater inleakage concentrated acid. At a place like Indian Point, where the river is tidal (sometimes fresh, sometimes salt) and either type of water could cause the inleakage, all bets were off. We tried modeling the crevices, and that was only partially successful. The problem is that most water models depend on the Debye-Huckel assumptions of a relatively dilute solution. When you have a very concentrated solution (2X, 3X) and high temperatures (water is less polar at high temperatures), the basic science simply isn't there for modeling. What should we to do for experiments, since modeling was of very limited help? Well, it got expensive. When we worked with denting, we could use "pots"...that is, lab-bench high pressure autoclaves, to do the corrosion testing for the tube support plate material. We could use lesser concentrations than true crevice chemistry and get good results. When testing stress corrosion cracking and so forth on alloy 600 and 690 tubes in crevices--we had to go all the way to true crevice chemistry or nothing bad would happen. However, no ordinary equipment would handle those temperatures and high concentrations in bulk. Bench-top autoclaves were close to useless. Also, we didn't know what the true chemistry was. So we used model boilers, with real heat transfer and real crevices, and tested that way. This was madly expensive. Model boilers at Westinghouse were single tube mock-ups of steam generators. The primary water side was heated electrically, not by fission, but everything else was the same as a steam generator. We made real progress on proper water chemistry for alloy 600 (existing steam generators) and alloy 690 (new generators). Another help was getting all the copper and admiralty brass out of the water systems, and changing out admiralty brass condensers for titanium at seawater plants. It takes very little copper to add a lot of OOMPH to the corrosion in crevices. So much progress was made by this research at EPRI while I was there! Alloy choice. Heat treatment choice. 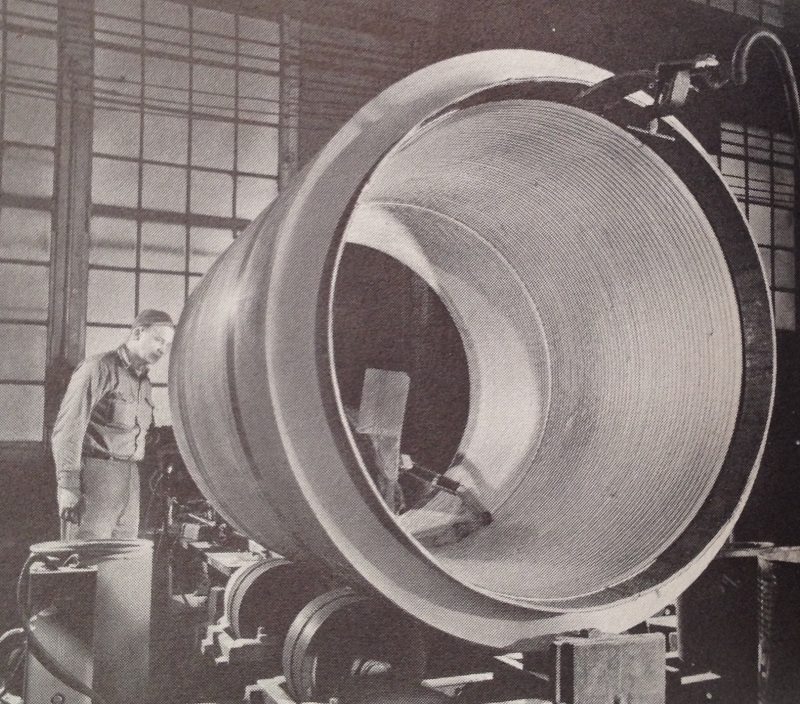 Fabrication of tubes. Stress relief of the tubes in the tube sheets. Tube support plates: Hole size, hole drilling techniques, material choice, quality control. Water chemistry, tested under the exact conditions of a real steam generator (model boilers) at great expense. Model boilers were huge (several stories tall) and were NOT cheap to run. Also, model boiler experiments often lasted for months. (How to go through a lot of money very fast.) Sometimes, we all thought this was annoying, because there were many possible bench-scale experiments that could have been done for the same money. But...bench scale didn't give us heat transfer and crevice chemistry. End of story. I am a chemist, and I didn't work on the fretting and wear and vibration side of steam generators. For these issues, computer modeling seemed to be very helpful (unlike crevice chemistry modeling), and there were experiments, including some in the model boilers. Now, you may say that I am being prejudiced in favor of the difficult issues chemists must face, and scornful of other people's problems. Okay. Say it. But still..
Vibration issues depend on many factors, including geometry and flow. Which also means that vibration patterns are relatively easy to change. There's nothing in vibration issues as tough as the ions-accumulate-in-the-crevice phenomenon. Most vibration issues are subject to amelioration without changing the laws of nature. Many things change the vibrational pattern of a steam generator. In contrast, you would have to change the laws of nature to keep crevices from accumulating salt loadings. And now, boldly stepping where angels fear to tread on Root Cause analysis for San Onofre...no matter how long a list of changes Gundersen claims for the new steam generators there, in my opinion, corrosion will not turn out to be any part of the problem. The root cause analysis will come up with something vibration connected. To cure it, some kind of derating of water flow (primary side and/or secondary side) with ameliorate the problem well enough to keep the generators in operation while the owners and the manufacturers sue each other. The generators will be replaced early. In the Steam Generator Owner's Group, we had a mantra of setting everything up to be "leak before break" (no catastrophic failures). That will still be the case for SONGS. Nobody would buy an old-style steam generator nowadays, and that is a good thing! There's no bait-and-switch about putting in a new style steam generator. The SONGS will rise again. I would like to express my appreciation for Meredith's efforts in writing this piece for two reasons. First, this piece is timely; the problems with the replacement S/G's at San Onofre are very "now" in the news, and readers really do want to know what's going on. There is some considerable weight given in Mr. Gundersen's work to the notion that not enough work is / was done to design replacement steam generators; Meredith's piece puts that to bed in short order. The second reason is that this piece goes right toward APR's stated focus of presenting the inside details on the technology of nuclear energy and the history of that technology. It is rare that we get this sort of inside glimpse at some of the work done in the past during this whole long course of the development of nuclear energy, and we're all the better for it having seen Meredith's work reproduced above. If any of the terms or mechanical details above were confusing please remember to see this post on APR which gives a great deal of detail on the overall design of steam generators. Thanks again to Meredith and to all of the people who reviewed and commented on this work prior to its publication here on APR. The 101st Carnival of Nuclear Bloggers is up today at the American Nuclear Society's ANS Nuclear Cafe site. This rotating event features the best that the world of nuclear bloggers has to offer and is a vital weekly step for those journalists who would like to find out what these writers are thinking and talking about. As always, ANS Nuclear Cafe has done a fine job with the Carnival post this week and it's worth a visit. SYLCOR WESTERN OFFICE 1: An Introduction. For information on APR's recurring features, click here. Sylvania Electric Corporation formed an Atomic Energy Division at the beginning of 1952 as a result of a December, 1951 contract with the Atomic Energy Commission to construct and operate what was described as a pilot or test plant for the manufacture of nuclear reactor fuel elements, including a metallurgy laboratory facility. The initial operations began at Bayside, New York, but another site was acquired in early 1952 and was located in Hicksville, New York. 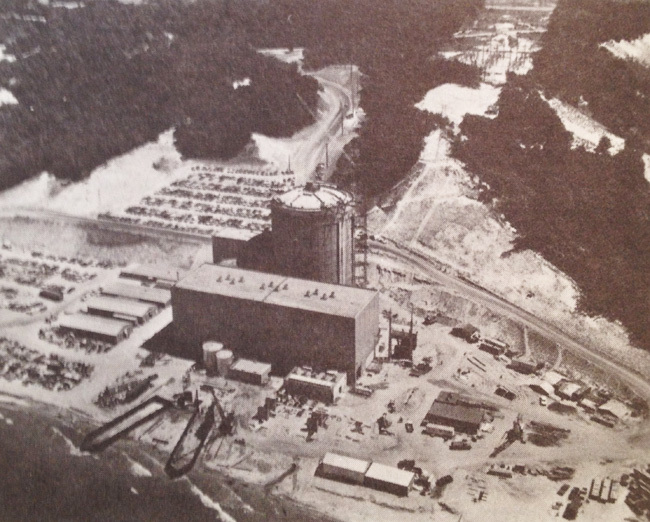 The facilities at Hicksville were greatly expanded with the addition of a new plant in 1957 expressly built for manufacturing of nuclear reactor fuel elements for commercial sale (and intended for use in research, test, training and power reactors.) Headquarters for the company remained at Bayside, New York. 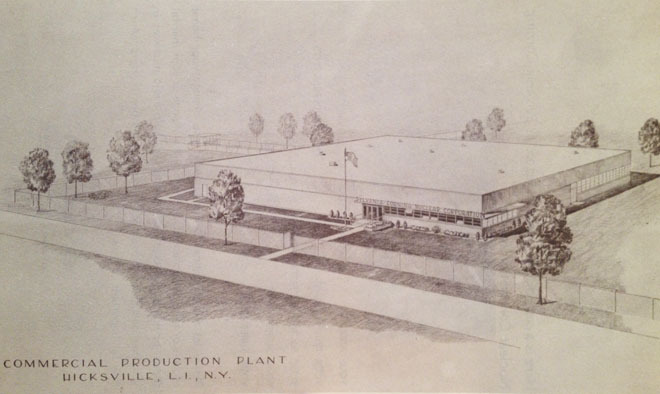 Below, an illustration of the Hicksville N.Y. Commercial Production Plant of the Sylvania-Corning Nuclear Corporation; taken from "You and Your Company" brochure issued to welcome and familiarize new employees, circa 1957. Sylvania Electric, as mentioned, had begun dedicated nuclear fuel research work for the AEC in early 1952. 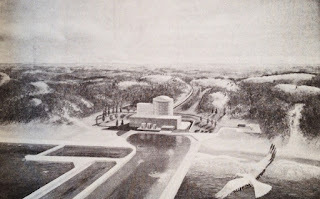 The opening up of the market (which I will cover in detail in a different post on Westinghouse Atomic Power Division) for commercial fuel fabrication led to Sylvania Electric and the Corning Glass Works combining all previous nuclear related operations of both into the Sylvania-Corning Nuclear Corporation in March, 1957. This development was, as we can see, concurrent with the acquisition of more land at Hicksville and the construction of the new Commercial Production Plant illustrated above. Syl-Cor or Sylcor, as the new firm quickly became known, was positioning itself to move into nuclear fuel production in a major way. 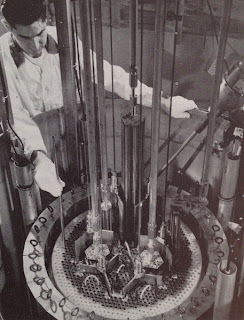 "The World's First Nuclear Fuel Company"
In April of 1957, Sylvania Electric Products Inc. and the Corning Glass Works combined their atomic energy activities and formed a new and separate company - the SYLVANIA-CORNING NUCLEAR CORPORATION (SYLCOR). This new, jointly owned entity is a logical and carefully planned outgrowth of the pioneering work of both companies in the nuclear field, and affords a far more effective utilization of skills and facilities. SYLCOR has a wealth of experience in high temperature metals and in the development and production of metallurgical, ceramic and cermet types of fuel elements. SYLCOR pioneered investigations in the field of high temperature metallurgy and high purity metals. Development programs have been conducted with stainless steel, aluminum, uranium, thorium, niobium, niobium base alloys, rhenium, tantalum, tungsten, molybdenum and zirconium - resulting in a number of significant contributions to the technology of nuclear energy. SYLCOR's prime objective is to provide a single economic source for complete out-of-pile services to designers, builders and operators of nuclear reactors. SYLCOR is a leader in new fuel and recovery developments, in the manufacture of reactor fuels and components, in providing a wide range of engineering facilities, and in making available the services of one of the largest privately-owned engineering, development and manufacturing plants devoted to this field. We will see later that the sort of image portrayed by the above quoted advertising copy was actually fairly far from giving a complete picture. The operation at Sylcor was not nearly so commanding in the field as pictured - and the actual internal operations of the company not nearly so industry leading. It is right after the launch of Sylcor and the large expansion at Hicksville for commercial fuel production in earnest that our featured man in this story, James O. Vadeboncoeur, enters the picture. I have acquired a large library of information from the late Mr. Vadeboncoeur (referred to often in interoffice correspondence as JOV, which seems handier given his last name) and it is around his experience with this company that we find ourselves able to build an inside story of the day to day operations, considerations, problems and competitive angles of the early commercial nuclear fuel industry. Manager's Staff - Direction and consultation in the development and operation of industrial facilities for the manufacture of nuclear power reactors. Emphasis placed upon capitalization, buildings and layout, personnel requirements, criticality and accountability control, and processing equipment. Supervisor of Central Production - Production supervision of manufacturing for the Nautilus and other reactor cores. (APR note: Many other cores.) Direction of scheduling, dispatching, inventory and production control, personnel placement, and industrial engineering. Design and implementation of cost control system. Preparation and control of manufacturing budgets. Administration of multi-million dollar contracts for melting and fabrication of zirconium. Preparation of cost analyses, advanced planning, and economic studies relative to facilities, personnel, and material requirements for nuclear fuel manufacturing. Sylcor hired Jim to travel far from its New York operations - to travel to California to start from scratch a Western sales office and staff to broaden its competitive situation from mainly an industrialized East-coast operation to a truly national one. And it would be rocky right immediately from the start. Next time: Jim finds himself in California without his family, without a house, and without an office. Yet. A fresh press release from Westinghouse indicates that the company will team with Ameren Missouri to fund and construct a 225 MWe Westinghouse SMR at Ameren Missouri's Callaway site. Click here for Westinghouse's press release. Click here for Ameren's release including a link to the Missouri Governor's release. Click here to see the Westinghouse SMR page. Click here to access the official site for Callaway Plant. This plan appears to serve Westinghouse's intent to firmly compete in the SMR field (against established competitors NuScale, which has plans to build in South Carolina, and Babcock & Wilcox / Bechtel who have plans to build at the former Clinch River Breeder Reactor site in Tennessee.) This establishes three reactor vendors firmly in the SMR field and seems to assure a future for this type of nuclear power generation, at least in the short term. Labels: "ameren", "callaway", "SMR", "westinghouse"
I would have to imagine that all of my regular readers will recall the situation that burst into open view at the end of last year regarding the internal situation at the Nuclear Regulatory Commission. If you don't, I'll just sum up by saying that a serious struggle within the actual Commission itself got to the point where the four Commissioners who are not the Chairman decided to contact the Congress in order to attempt to resolve the problems they were experiencing with the treatment given them by Chairman Jaczko. All four were in agreement that something had to be done; all four had serious problems with Jaczko's operational method, his demeanor, his selection of information to provide or withhold, and his policy making. The four Commissioners are a varied lot of appointees, both placed by Democrats and by Republicans. For a good and thorough summation of last year's events CLICK HERE for a December 13 article on APR. For my opinion on the outcome of the House Oversight Committee hearings (which I watched) CLICK HERE. Remember after reading this that no punitive actions were taken by any government body against Jaczko. This backstory is relevant today, April 19, 2012 because Commissioner Svinicki is up for reappointment... and the former employer of Chairman Jaczko, Harry Reid (Democrat) and one of his pals (Barbara Boxer, Democrat) have apparently decided to try to hold up Svinicki's reappointment. Based on safety issues. That's right - safety issues. If we just take a second to look into the details that this article offers (and perhaps if the HuffPo is really on the D side of the aisle, it should think about "editing" the Boxer history vis a vis events concerning Svinicki) it's clear that Boxer had dropped the Yucca truthfulness issue after Svinicki explained her answer to Boxer again. It's only too convenient that Boxer "recalls" this issue once again now. And looking at Harry Reid - well it could not be more obvious than it is that Reid is simply trying to get rid of anyone that might oppose Jaczko. Reid's modus operandi has been built on "No Yucca Mountain" and Jaczko's job, while working for Reid, was to ensure that. Once Jaczko was NRC Chairman he was in a position to attempt to enforce it, even though the Federal Government is still obligated to do something about a central waste repository. (Reid and Jaczko don't care about building one - they only care that no one EVER builds one in Nevada.) Now, Reid will turn the heat on Svinicki as punishment for the entire Oversight Committee episode, during which not only Svinicki but all four Commissioners in total attempted to halt Jaczko's dictatorial management and political agenda. The political agenda couldn't be more clear today, folks. It really couldn't. If there were no political association, would Reid care about reappointing an NRC Commissioner whose tenure has covered a period of total safety at US nuclear plants? Would he want a change of leadership while post-Fukushima work is still so heavily in progress? The answers to those questions are "No." Nuclear safety is far too serious an issue for us to continue to allow partisan politics to be inserted. Partisan politics has placed a man (Chairman Jaczko) in position of a Commissioner of an agency wherein he has not one day's worth of operational experience. That's right - I've said this before and will say it again now - Jaczko has not one day's worth of nuclear power plant operational experience or education. How is this conceivable? How is this possible? How is this sensible? And now, it's clear that Reid et al would like to remove Svinicki.. and replace her with what, another selected appointee with political motivations and ties and no nuclear experience? This situation is becoming more and more ludicrous by the day. Had the proper action been taken after the Oversight Committee hearings and Jaczko been censured or fired (you all know that at a civilian business, HR would have become involved instantly and taken action) we would not be here right now. The fact that partisan politics have already pushed the Nuclear Regulatory Commission's conditions to this point should be enough to make everyone realize that nuclear plant safety has nothing to do with being right of left of the aisle. It has to do with qualified people making informed decisions in consensus regarding all issues that have an impact on safety. You can't do that properly with no experience and a political tiedown. Filling the Commission with politically selected lap dogs is the vision of Reid - and it's a vision of peril. It did not take long at all for the White House to make a response to this situation in the form of a statement that President Obama will RENOMINATE COMMISSSIONER SVINICKI. Thanks to Mimi Limbach and to Dan Yurman we have links below to stories just hitting the wires right now about the renomination announcement. I can assure you that a number of us are following these developments and further news will be posted here at APR either amending this post again, or as a new post. Two links from THE HILL. Second link, today's brand new post. One has to imagine that McConnell was not aware yet of the Administration's announcement to renominate Svinicki when the comments were made - what this second link does is help indicate what the overall view on the Republican side of the aisle is over this issue. APR has attempted to get a statement from Rep. Darrell Issa (R-Cal) who chaired the House Oversight Committee hearings on the NRC Commissioners' letter about Jaczko's behavior. If and when a reply is received which has been approved for release you'll see it here; if it is a general news story published elsewhere or on Mr. Issa's site I'll link it. Labels: "hearings", "jaczko", "NRC", "oversight", "Reid", "Svinicki"
Atomic Power Review is proud to welcome you to the 100th Carnival of Nuclear Bloggers. This rotating event is hosted at a variety of the most prominent pro-nuclear blogs and websites on a weekly basis. One hundred of anything is an important milestone - important enough to gain considerable attention. In light of this fact, we open the event with official statements from the American Nuclear Society and from the Nuclear Energy Institute. Congratulations to the nuclear bloggers and advocates on the occasion of the 100th Carnival of Nuclear Energy Bloggers. This milestone is a testament to the energy and passion of the nuclear community to share information on the benefits that nuclear energy holds for humanity. You are the people with the knowledge and passion to talk with friends, neighbors, policy makers, teachers and students about these issues. It will take all of us to state the truths and take the initiative to counter fear, uncertainty, and doubt, and make others understand the importance of energy sufficiency and how it can be achieved through atomic binding energy. As a vanguard in nuclear communications, you have embraced nuclear technology—a young and still evolving science—and have adapted to new and evolving communications avenues and social media outlets to share your vision. 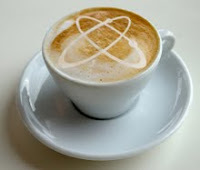 The very first Carnival of Nuclear Energy bloggers was on May 13, 2010, at Next Big Future. Although 2010 is not so long ago, we can all agree that much has happened over the following months—and much of it was catalogued, interpreted, and shared by the individual bloggers who join together each week for the carnivals. The carnivals not only strengthen and extend the reach of individual blogs, but also strengthen and extend the nuclear community as a whole. I predict that the pessimism which now makes much noise in the global public about all things nuclear will be proved wrong in our own time. Thank you for your efforts, and I look forward to reading about the 200th Carnival in March 2014! When NEI Nuclear Notes debuted in February 2005, it was safe to say that a convention of nuclear energy bloggers could truly be held inside a phone booth. Outside of pioneers like Rod Adams of Atomic Insights and John Wheeler of the podcast This Week in Nuclear, there just weren't that many outlets advocating for the expanded use of nuclear energy. Of course, that didn't mean that people weren't talking about nuclear energy online. If you only took the time to listen, it was clear that plenty of folks, many of them very conversant in terms of both technology and public policy, were talking about it all the time. In short, there was a conversation going on about our industry, and it was far passed time for NEI to get involved in that conversation. Now, it's more than seven years and over 4,800 posts later. When ANS sponsored a meeting of nuclear energy bloggers last Fall, the hotel meeting room was overflowing with people, one seemingly more enthusiastic than the next when it came to advocating for nuclear technology and the commercial industry. So as we celebrate the 100th Carnival of Nuclear Energy, I'd like to take a moment to salute all of the nuclear bloggers, a group that's just about too large to count these days, for the great work they do every day. Needless to say, we look forward to celebrating other milestones together with you in the years to come. I would personally like to sincerely thank both ANS President Loewen and Mr. McErlain of the NEI for contributing these statements for this 100th Carnival. A regular feature seen on APR when it hosts the Carnival is the "What is this?" photo, wherein I display a photograph of some indescribable piece of nuclear plant equipment, for example, and ask readers to guess what it is before presenting the answer after all of the Carnival entries. Episode 100 for the Carnival continues this tradition; since this photo is quite possibly the easiest yet to guess, I will be providing graded or graduated point value answers at the end. So - What is this? Answer - and more - at the end. Now, on with the Carnival - surely one of the largest and best this author has seen, with plenty of excitement! APR leads off the Carnival this time with a post from a website that a number of us have actually been waiting some time to see. This first contribution is from the first blog post at the site of the Nuclear Literacy Project which has only just launched this weekend. Suzanne Hobbs has put a lot of work into this project over some considerable period of time; I highly suggest everyone look around the site and keep looking back at it as it grows; the whole site will be live tomorrow (4/15) according to Suzanne. Kallie Metzger recently attended a talk by anti-nuclear activist Dr. Helen Caldicott. Metzger's reflections on the encounter provide a stimulating and sobering look at what the anti-nuclear author delivers and doesn't deliver. Two recent nuclear energy start-ups have the potential to create new business opportunities with unconventional reactor technologies. Two of them are pursuing new designs using molten salts as compared to the conventional light water design. In Massachusetts, Transatomic Power, run by two Ph.D. candidates at MIT, Leslie Dewan and Mark Massie, the effort is focused on using uranium-based spent nuclear fuel to provide the energy to run the reactor. Their business model is to license a design to a major reactor vendor or a state-owned reactor development agency. 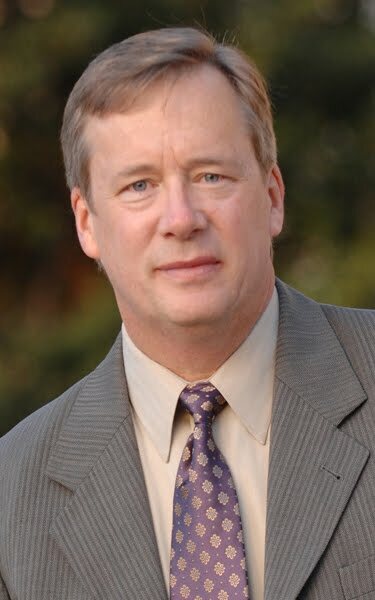 In Alabama, Flibe Energy, named after an acronym for a a specific type of salt, is run by Kirk Sorensen who after earning a masters degree in nuclear engineering, jumped out of the corporate world to develop a start-up effort aimed at producing a thorium-fueled reactor for military applications. While the rest of the country focuses on the NRC’s approval of four new Westinghouse AP1000 reactors at two sites, the Tennessee Valley Authority has its own in-house version of the nuclear renaissance and right now it is running late. TVA CEO Tom Kilgore said at a press briefing April 5 that TVA expects the project costs for Watts Bar 2 to increase by $1.5-2.0 billion. Also, he said the schedule will be revised with completion now set for the last quarter of 2015 compared to the original date of 2012. According to Rick: Light entry but has significant collection of links that will continue to grow relating to advocacy and pronuclear action. Features clothing and jewelery by popatomic plus useful reading about taking action and keeping informed. Maxing out technology (including nuclear power) for 2027-2032. I am expecting several possible technology for an energy revolution to be proven over the next 5 years. Candidates energy technologies are advanced modular fission reactors, new hot nuclear fusion technology, or breakthrough low energy nuclear reactors. Annular fuel (hollow cylinders with pebbles for more surface area) enables existing nuclear reactors to generate 20-50% more power. South Korea is working on developing the MIT research for commercial installation in about 2020. The company Lightbridge is developing the fuel and could have wide deployment by the early 2020s. Japan to restart nuclear before summer? Japan has all approvals but local consent to restart two reactors. Trade Minister Yukio Edano also said that he will visit Fukui prefecture, host to the No. 3 and No. 4 reactors at Kansai Electric Power Co's Ohi nuclear power plant, on Saturday to meet with the governor and Ohi town mayor and to convince them of the necessity for the restarts.Edano set no deadline for the reactor restarts, but implied that he hopes to obtain public backing by July, when the hottest season starts. Total nuclear electricity generation in 2011 was 2518 TWh, 4.3% less than the 2630 TWh generated in 2010, according to figures from the International Atomic Energy Agency (IAEA). Generation had increased in 2010 following three consecutive years of decline. Japan's generation was down 127.7 TWh and world generation was down 112 TWh. Germany shutdown reactors for another 30.7 TWh decrease. So the world generated 46.4 TWh more if the effect of Japan and German shutdowns were excluded. Looking at 2012, generation will increase from 14 new nuclear reactors. ANS Nuclear Cafe - Paul Bowersox (submission) with article by Wes Deason. Space Nuclear Propulsion, Part 2. "Space nuclear propulsion: Humanity’s route to the solar system"
At Nuke Power Talk, Gail Marcus takes on the claim that is beginning to circulate that "after all, Japan survived for a year without nuclear power, so it doesn't need its nuclear plants." She points out several factors that show 1) that there were a number of serious effects on the economy, and on the population, from the reduced electricity supply, and 2) there are several factors that could make next summer much worse. Evaluating accidents: Is "No Radiation Deaths" enough? Gail Marcus also explores the issue of how we should evaluate accidents in the future. While it is certainly a plus that Fukushima has resulted in no radiation deaths to members of the public, the collateral damage has been huge in terms of the impact on the lives and livelihoods of thousands of people. She suggests this is going to cause us to reconsider what needs to be protected. Even an accident that kills no one outright may be unacceptable if it requires long-term evacuation of large areas for long periods of time. A report on one of the two yearly open houses at White Sands Missile Range that opens Trinity Site to the public. Trinity Site is where the first atomic bomb was tested, between San Antonio and Carrizozo, New Mexico. How do cultural factors influence (and sometimes even distort) the perception of risk - particularly the relative risk of nuclear energy compared to other sources? And what can nuclear energy communicators do about it? Steve Skutnik examines how nuclear communicators and advocates can leverage understanding how cultural factors influence perceptions of risk to more effectively communicate nuclear risks in context. Yes Vermont Yankee describes the usual arguments that opponents make against the continuing operation of Vermont Yankee past March 21, 2012. Angwin discusses the plant age, concerns based on Fukushima, and "nuclear waste on the banks of the Connecticut." She notes that plant opponents may consider every day of operation past March 21 to be a personal insult, but actually, Vermont Yankee continues to be a boon for the state of Vermont. The price of North American natural gas has been ridiculously low since before the recession of 2008. In that time, Ontario essentially shifted from coal-fired power generation to gas-fired. Has this three-year period of low, low gas prices translated into any relief on provincial electricity prices? No. Prices for power have gone up. In this post, Steve Aplin of Canadian Energy Issues explains why. discuss some of David's concepts in "More on the Denatured Molten Salt Reactor from David LeBlanc." Leslie points us to this page on his site, which contains two items he'd like to indicate for inclusion in this 100th Carnival. The first is the release of his book "Fukushima: The First Five Days," for which we find a description on the above linked page. I myself had a chance to review this book pre-publication and am honored to have provided the forward for it - I would suggest this book to anyone interested in the events at the site during those critical hours and days early in the accident progression. Also on this same page is Leslie's Carnival blog post, from April 13 and which is titled "Irrational Korean missile fear replaces irrational Nuclear fear…almost." In this post, Leslie Corrice details how Fukushima provincial Governor Sato deflects attention and cultivates crisis. Finally, we have some more good news. Carnival 100 is not just the launch date for one new website, but two! Here is a brand new blog, just launched this weekend, by an author totally new to the world of nuclear blogging. In the initial post on this new blog, "Entreprenuke" discusses his concept of this new term and his new blog. Two further posts of interest including a short bio are also already online as this 100th Carnival goes to press. Welcome aboard to this newest pro-nuclear blogger! Well, that's it for the participants in Carnival No. 100. And what a list! There is enough reading there to keep one busy for days. All that's left is to identify what was in that illustration at the top of the Carnival post. I mentioned that the possible answers would be graded. I wasn't kidding. If you guessed "it's a nuclear power plant" you get zero points, because that has to be so obvious - given the name and nature of this blog - that it can't count. If you guessed "it's a lithograph" you get negative ten points. If you guessed "it's a late 1960's or early 70's looking illustration, almost surely of a pressurized water reactor plant since boiling water reactor plants didn't have cylindrical reactor buildings yet" you get ten points. Because you'd be right. If you said "PALISADES" you win and get one hundred points. I don't know what you'll do with them - there's no prize booth. 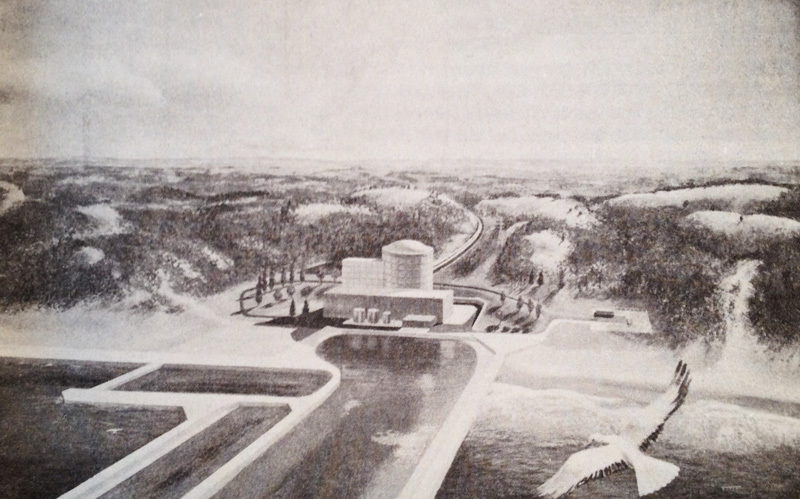 The illustration was furnished to the Atomic Energy Commission by Combustion Engineering for inclusion in WASH-1082, "Current Status & Future Technical & Economic Potential of Light Water Reactors," March, 1968. 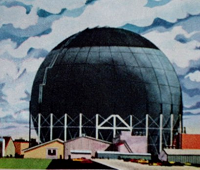 This is an artist's conception from architectural drawings of what the completed plant would look like; much of this kind of artwork can be found in a variety of places for nuclear plants - and you can find quite a bit of this kind of artwork for plants that were never finished or never built. Let's take a look at a few other illustrations of Palisades in the APR collection. This is a photo that best approximates, from those available here, the illustration we've seen earlier. It is easy to see that the highly complex channeling arrangement for cooling water from and to Lake Michigan was not built as in the illustration we first saw. 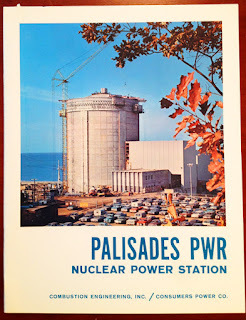 In fact, although not originally designed with one, Palisades eventually had cooling towers added. The illustration we see here is from a detailed book covering Palisades, issued by Combustion Engineering and Consumers Power. The cover of this book is seen below. Below, we see a photo from the Benton Harbor News (AP Wirephoto) in the APR collection, dated 10-10-1974 and which shows one of the cooling towers. The plant (according to the caption) had just restarted after about a year having been shut down for work. 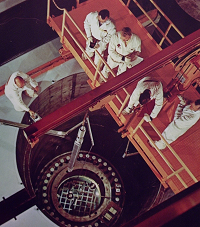 According to WASH-1203-73, "Operating History - US Nuclear Power Reactors" (USAEC Division of Reactor Development and Technology) the shutdown mentioned in this press photo was for the repair of a leak in "B" steam generator, which as we know today was successful. 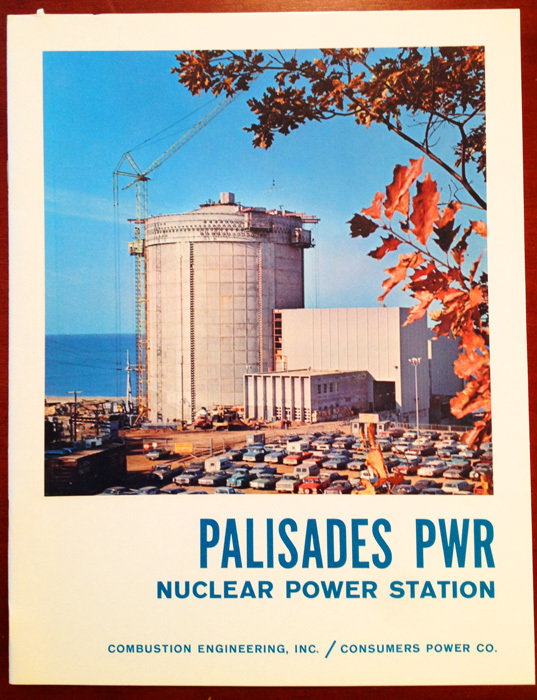 Palisades first achieved criticality 5/24/71 with the first electric power generation 12/31/71. 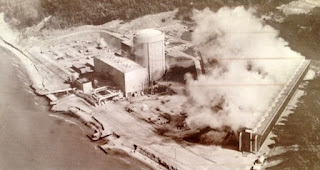 Palisades is still operating today; click here for the Palisades Power Plant site. As a final note.. this site was originally planned to host as many as four identical reactor plants, with the other three plants North of the completed one (that is to say, to the left in the illustrations we've seen.) Palisades was ordered in June, 1966 with the clear intention to eventually order more (in fact, WASH-1203-73 lists the plant as "Palisades Plant, Unit 1.") Palisades' construction permit was issued in March 1967 but no other units at the site even had construction permits issued; in fact, none of the other three plants was ever formally announced, from what I can find on file here. The only proof that further plants were planned is an illustration in the CE/Consumers Power brochure showing the four plant site layout, coupled with WASH-1203-73's delineation of the plant as Palisades 1. That does it for this historic 100th Carnival. APR is proud to host it, and I hope that we make it to 200. Having seen the success of pro-nuclear blogging myself, first hand since APR launched in April 2010 I have no doubt we will. There is very little actual news to report yet; the NRC Chairman has toured the plant, and a brief report of this trip is available on the NRC's blog. Click here to read that report. Far more interesting is the fact that apparently SoCal Ed has awakened to the need for direct approach to the public and the website I've just found which is attached to the SoCal Ed site for SONGS (San Onofre Nuclear Generating Station) is proof. The website is actually pretty impressive; it's located at "songscommunity dot com" and the entry page is found by clicking here. Of great interest is this page, which is called "Just the Facts." This tells why this new website has appeared, gives some answers to questions and really drives home some of the real answers to questions commonly asked by those who don't know much about nuclear energy.. and as a result, it also squashes mistruths told by anti-nuclear opponents. This page is a good playbook, if you ask me. It's accurate, fair, not too heavily loaded and probably exactly what SONGS and SoCal Ed need right now. Not only is there a great deal of information available about plant work in progress (specifically pdf files describing steam generators) there's also a plant status box which will show status in real time. There's even a link to a version of the site in Spanish, which is a great touch. This site, when combined with the original site (see link here) about SONGS makes the web presence for SONGS move up toward the top ranks. I am fairly well impressed by the new site and am glad to see how well it's done. I suggest everyone interested in pro-nuclear outreach give the new site a look. San Onofre 2 and 3 - the plants shut down now with steam generator problems - are Combustion Engineering PWR plants. 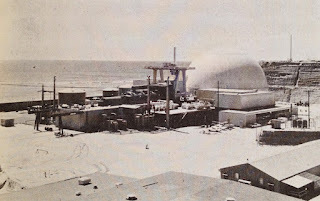 San Onofre 1 was a Westinghouse PWR which operated for many years beginning in 1968. This plant is now totally gone, at least to the naked eye; see here. This link has an interesting photo showing San Onofre 1 in process of demolition. Here are two early photos of San Onofre 1 from APR's files. The photo above is from WASH-1082, published in March 1968 and shows San Onofre 1 in the final stages of construction and testing - at least, it would appear so by the completeness of the plant but presence of many work vehicles around. 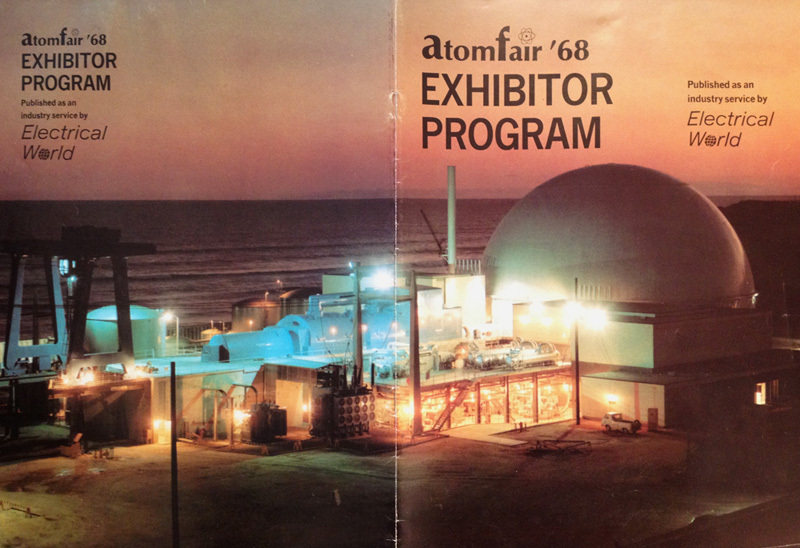 Above is an impressive night photo of San Onofre 1 from the cover (fully open, showing front and back) from the AtomFair '68 Exhibitor Program in the APR collection. Both photos enlarge when clicked. UPDATE: Af of Friday morning, there are reports from SoCal Ed that both plants are exhibiting the same kind of wear in their steam generator U-tubes, and that more damage has been found in tubes at No. 2 plant. A number of articles are out this morning; click here to read one. More details later as they're found. The 100th Carnival of Nuclear Bloggers will be hosted here at APR this weekend. I would encourage everyone associated with any pro-nuclear / nuclear related blog to get contributions in on this one, which will be heavily promoted. And it should be heavily promoted - the world of pro-nuclear blogging has come a very long way in order to be able to reach this pinnacle. APR is proud to be hosting it. Keep watching for further announcements. The rotating Carnival is your best way to find out what the pro-nuclear world is writing about and discussing. There is no equivalent weekly media wrap-up of this sector, which is why the Carnival should be important to anyone interested in nuclear power, national energy policy, or sustainability. If you're an energy reporter for a major media outlet and you're not looking at the Carnival every week, you're making a major error. Nest week is the 100th Carnival - sure to be an extravaganza, with lots of contributions and some extra features - and it's going to be right here at Atomic Power Review. Do not miss it. Atomic Power Review catches up on two of this week's developments, and offers some background as well. NEW BOOK: My friend Leslie Corrice has just announced that his new book, "Fukushima: The First Five Days" is now ready for purchase and download. Find the book here. This volume is a highly readable account of the accident at Fukushima Daiichi following the tsunami, taken from various official sources but developed and presented in a manner that makes access to the chain of events possible for even the layman. I believe it is a very significant opening dialogue for the general public in terms of the public becoming conversant with the actual event sequence. WESTINGHOUSE, BABCOCK & WILCOX, ETC. This week was somewhat significant in terms of news in nuclear energy because the news was of a corporate and not a safety related nature (for the most part), dominated as it was by the shakeups at Westinghouse Electric which culminated in the CEO of that firm resigning two days into his tenure only to sign immediately with competitor Babcock & Wilcox. Click here to get up to speed on these developments. What is more interesting perhaps in the long run (for it cannot be anything but true that Westinghouse parent company Toshiba will not allow this to affect business in any meaningful way) is the fact that we now find Westinghouse and Babcock & Wilcox in direct competition for what just might be a very hot ticket - the Small Modular Reactor market. These are light water cooled reactors that are built in compact and shop-assembled form and which are easy to install .. or at least, are much easier (and cheaper) to install than a conventional plant, such as the four Westinghouse AP1000 plants being built here. These plants are at the moment generally less than 225 MWe and might be ideal for military installations, small co-op electric utility companies, multiple installations together for generating where the additive cost for the required MWe output is still less than one large plant, and probably more. What many people might not know is that these smallish plants aren't new at all - not totally. 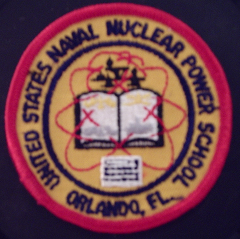 Just briefly, we can mention the fact that very early on the United States Army and the United States Air Force were interested in small nuclear plants for various remote installations. While all of these early plants did not really fit the SMR description as we know it today (modern SMR plants have all components, including steam generators and coolant pumps inside a compact primary containment) they were much smaller than commercial or even most experimental plants in the early days. Let's take a look at just a few illustrations from the APR collection showing some early small plant components. Above, from a 1959 ALCO Products ad, we see a representation of that company's design for packaged power plants of the general type supplied to the AEC/Army as the APPR-1A, later known as SM-1A. This plant supplied just over one and a half megawatts of electric power, but also significantly just over 11 MW of thermal energy (steam heat) for arctic facilities. A number of early small designs such as this were dual-output plants. Note the size of the primary plant components when compared with the human figures outside the containment. Above is a reactor pressure vessel for one of this general size range reactor plants at ALCO's facility undergoing the process developed at ALCO whereby stainless steel was overlaid on a (mandrel) forged, seamless carbon steel pressure vessel, and then submerged-arc welded to the surface to provide corrosion resistance on the interior (i.e. the surface in contact with primary coolant.) The smallish size of the vessel is quite evident. This is from the same multi-page ALCO advertisement as the illustration shown above. ALCO was either reactor vendor and contractor, or else reactor vendor, for several early small sized PWR reactor plants. The Martin Company (Nuclear Division), later Martin-Marietta was also active in supplying and advertising small pressurized water reactor systems. Below, the MPR or Martin Power Reactor which was a flexible core design allowing anywhere from 8 MWt to roughly 24 MWt and which could be ordered to develop from 1 MWe to 5 MWe plus steam heating. 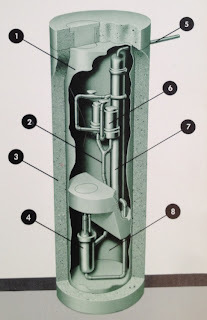 Martin offered just the reactor, or the whole primary system as seen below (constructed underground to avoid construction of costly shielding) or an entire plant. 1: Steel envelope. 2: Primary piping. 3: Reinforced concrete shielding. 4: Reactor. 5: Steam line to turbine. 6: Canned pumps (this means the pumps are hermetically sealed and require no external lubrication.) 7: Steam generator. 8: Shielding water. It is clear from this illustration that the overall plant is very compact; this is a step along the way from early small nuclear plants with discrete components widely spread toward the much more economical designs that move all components possible into the containment and later all possible components into the (now expanded) reactor pressure vessel. Below, the MPR reactor itself showing the single center and three 'eccentric' control rods, and the boxed fuel elements that each contain 50 tubular fuel rods. The offering described above (seen in a Martin sales brochure for the MPR product line) is similar in many ways to the plant actually built as the PM-1 for the Air Force and which was installed at Sundance, Wyoming. 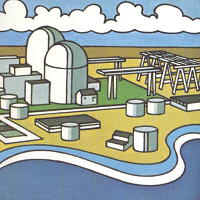 Below, an illustration of that plant from the Atomic Energy Deskbook (Hogerton, 1962.) Note the similarity, generally, of the primary plant components. This plant was rated at 1 MWe with 2 MW of steam heat additionally. 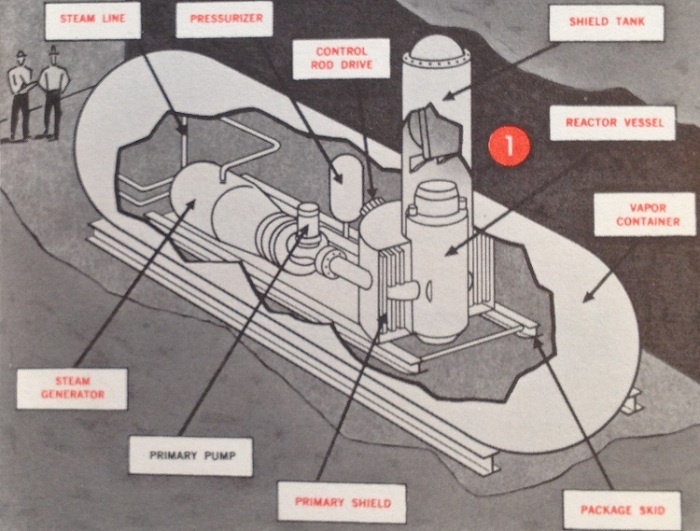 Below, also from the Atomic Energy Deskbook, a view of the zero power core mockup for the PM-1 reactor. The scale is evident and the compactness notable. Information about the current Westinghouse SMR offering is found here. Information about the Babcock & Wilcox / Bechtel "Generation mPower" SMR can be found here. Further information on the Generation mPower is found at Babcock & Wilcox's site; click here. Readers can be certain that APR will keep an eye on the competitive situation (both are going after DOE funding for the SMR projects) and report developments here. Westinghouse Electric, most widely noted in recent news items as the manufacturer of the AP1000 design (1000 MWe pressurized water reactor) being built at Vogtle and now, with recent issuance of COL's at V.C. Summer (total of four units) has had quite an eventful couple of weeks in terms of business developments. Those moves were at the top positions of Westinghouse's Nuclear Fuel Division and of its Americas Region. However, within a few days Westinghouse announced a restructuring of its nuclear power plant product line; click here to read a press release. This move, also attributed to Ferland as was the previous personnel change, was intended to improve the company's chances for continued growth in the field. The move split Westinghouse's nuclear plant manufacturing operations into two divisions; one called Nuclear Power Plant Delivery (in charge of actual manufacture and delivery of plants) and the other designated Nuclear Power Plant Business Development, which essentially appears (at least initially) to be focused on marketing Westinghouse plants. At roughly the same time Westinghouse applied to the Department of Energy for funding to support its (rather secondary, until this time) developmental program for small, modular reactors (SMR's.) Read a release here. This move attempts to place Westinghouse directly into the fray to compete in this market sector which is rapidly gaining attention - particularly because of competitor Babcock & Wilcox's progress towards building several of its SMR designs at the TVA's former Clinch River Breeder Reactor site. In this release the Westinghouse SMR is described as 225 MWe. Fascinatingly, there is now an upheaval in progress at Westinghouse even with all of these developments. Yesterday, news broke that incoming Westinghouse CEO Jim Ferland had resigned effective immediately. Click here for the April 3 Westinghouse press release. No reasons for the departure were given in Westinghouse's press release. No effect is noted on Ferland's previous moves as regards personnel, or as regards the division of the nuclear business, or as regards Westinghouse's approach to the SMR field. One has to wonder if some or all of these decisions will be altered or reversed. Today we have another surprise; Jim Ferland has just this morning been announced as the incoming President and CEO of Westinghouse competitor Babcock & Wilcox. Thanks to David Bradish at Nuclear Energy Institute, we have the link for B&W's press release; click here to read the still new press release. The whole shakeout of the effect at Westinghouse is yet to be seen; however, the owners of Westinghouse (Toshiba) are sure not to allow these developments to affect their skyrocketing success of late with construction of numerous AP1000 large commercial nuclear plants here in the United States and in China. What happens to the personnel and operations of Westinghouse is yet to be seen, but the most interesting observations will come as Westinghouse and Babcock & Wilcox appear to prepare to go head to head in the SMR generation field. We are steaming ahead toward the landmark 100th Carnival of Nuclear Bloggers, as you'll see at this week's Carnival.